Just because it’s September and football season is upon us doesn’t mean summer is over. And here to provide you with his summertime faves is our fearless leader, Lee Wilson. Shoe(s) - I love Inov-8 trail shoes. I've worn a few flavors of their shoes, but my favorite over the years has been the Inov-8 X-Talon 195 (flexible, light and awesome traction). Currently, I've been wearing the Inov-8 Parkclaw 275, and it's been really nice...room in the toebox, cushion for the longer runs, and per the usual with Inov-8 . . . good traction. On the road, I'm not as picky. I wear about six types at one given time (Mizuno Shadow, adidas Boston, HOKA Hupana, Brooks Revel, ON Cloudflow and Altra Escalante), and I like them all, actually. I've never been one that's stuck on a certain flavor of shoe because I like my muscles (or lack thereof) to get a different workout each run. Plus, styles change from season to season. By changing it up, I don’t get all bent out of shape if a brand changes anything. Nutrition - As far as gels go, something that is tasty and doesn't mess with my GI are key. I usually go with a combo of two local brands...Huma and Spring. As for Huma, any of the fruit ones (I'm not a chocolate or mocha gel fanatic), and with Spring, you can't beat Canaberry. For hydration, I like Skratch because it's real (without any chalkiness) and doesn't mess with my GI. I also like using GU Roctane because it has quite a few calories which is always nice during long runs. Apparel - I'm not too picky on shorts, although I still love the split shorts (makes me still think I'm fast, possibly). I've never really had a pair that I couldn't stand wearing as long as it's not past my knees and too much fabric that holds sweat during these humid months. My favorite shirts at the moment are the Patagonia Cap (because it's thin and light) and the North Face BTN (for the same reasons...light and doesn't hold much sweat). Socks - I will wear the Swiftwick Aspire Zero, Balega Ultralight, and on the trails, I'll try to put on the Swiftwick Pursuit Hike Four (thin and seems to be durable so far). Thanks for sharing your wisdom with us, Lee! There's still plenty of hot summer running left . . . stop by to stock up on any of Lee's favorites! Tom Cirillo has been a staple at 12South Runners, PR Bandits, and East Nasty for a long time, and now he's joined our RunWILD trail training group. He's currently training for his first 50k -- StumpJump -- and we wanted to join Tom on his Trail to 50K. Tom was gracious enough to answer some of our questions, and over the next few weeks, we'll give you insight into why a 50K, his training, and any fun adventures he has a long the way! NRC: What made you want to race a 50k? Tom: Two races, one that I ran and one that I volunteered at, made me want to race a 50k. Last November (2017), I ran The Flying Monkey Marathon in Percy Warner after a few years of hearing about how hard, hilly, and awful it was. I wanted to run it like a regular marathon even though it isn’t. I didn’t want to walk the hills and just stroll to the finish. From July until race day, I focused on that race and ran at Percy Warner about 3 times I week. I gradually stepped it up from the 5.8 to the 11.2 to going double on the 11.2 (11.2 x 2 is my favorite road training route in Nashville). The race was, to this point, the most challenging one I’ve done, but I felt great while I was running, was happy with the result, and knew that if I made and followed a tough training plan, I could run a race that was a more than a typical marathon. The past two years I’ve volunteered at an aid station for NRC’s Dark Sky race. The whole experience - from hanging out in the woods at the aid station to watching the runners go for 50 miles – made me want to participate as a runner in an ultra distance race. Tom: I chose StumpJump because it’s fairly close to Nashville and because several friends have enjoyed running it in the past and can give me some pointers. NRC: How long have you been running? Trails? Tom: I’ve been running since 2008 when I was a grad student at USC. I had done some other sports in high school (football, wrestling) and college (football – Go Kenyon!) – running was either a conditioning test or a punishment in those sports and anything more than 50 yards was considered long distance. After my incredibly mediocre gridiron career came to a close, I kept up with some working out but never thought much about running more than a mile at a time. When I got to USC I became friends with some guys who led a club sports team that trained for the LA or Pasadena marathon from October to March every year. I ran the Pasadena Marathon in March 2009 – finishing the race itself was an incredible feeling, but it had been the training that I really loved. I made great friends, many of whom I’m still in touch with, I had something to do every weekend, and I found that I actually like getting up at 5 am on Sunday mornings to run 15-20 miles. Two months after my first marathon, I ran the LA race and I was hooked from there on out. From 2009 to 2014, I ran two to four marathons per year – never super-fast but with steady improvement. When I moved to Nashville in the summer of 2015, I was coming off an injury that had had me out of commission for three months. I was psyched to find all the running groups (namely East Nasty, 12South, PR Bandits) in town – I jumped into those in order to meet people and learn about places to run in Nashville. I vividly remember doing the 11.2 in Percy Warner on July 4th, 2015 with PR Bandits, we saw a huge great horned owl right before starting and I thought “this could be a pretty interesting place to run.” However, I still had only a vague idea about the trails in Percy, despite hearing people talk cryptically (as far as I was concerned) about running “three reds,” “red, white, and blue,” etc. I think my first time on trails was NRC’s Dry Creek Half in February 2016. I tried looking back to see if I had gotten off-road before doing it, but it was in the pre-Strava days for me so I’m not sure. Dry Creek was a good first trail race for me – approachable and runnable for someone new, but with enough rocks, roots, and mud to make it an adventure. The atmosphere of the event was also a huge factor in making me interested in doing more trail races. It was more laid back than a road race - runners and aid station volunteers were really encouraging to all the participants, but people were still out to work hard. I signed up for the NRC 6-mile trail series, but I still hadn’t made running the trails part of the weekly regimen. I sprained my ankle at Bells Bend and thought that maybe I wasn’t cut out for this stuff and that I should stick to the roads so that I wouldn’t get injured. However, I’d also gotten the idea stuck in my head that trail running was real running and if I wanted to really run I’d have to do more of it on trails. I made sure I got out on the red trail in Percy once a week for the summer of 2016 and signed up for the rest of the NRC series. I ran those without hurting myself and decided to try the Dry Creek Marathon in February 2017. It was so much harder than the half had been and I faded really badly at the end. I was shuffling at probably a 15:00/mile pace thinking that theoretically I could keep this pace forever, but I ended up walking until I was just around the bend from the finish line. I returned to the roads for the rest of the winter and spring, but still wanted to be a trail runner. Over the summer of 2017, someone was talking to me in less than flattering terms about the NRC Defeated Creek race and told me that “it was definitely not worth doing for just a t-shirt and no medal.” The name of the race and the description sounded cool if not a little intimidating, and I didn’t really care about a t-shirt or a medal, not that there’s anything bad about t-shirts and medals (turns out entrants got a hat and a cup too – who am I kidding? races are about the swag). The race lived up to its name - it was a harrowing slog especially early on when you’re “running” sideways down rocky uneven switchbacks. But after a mile, the course was more or less runnable up to the big climb that gets you to the turn-around point where you’re greeted with some incredible views that are better than t-shirts or medals. I think that’s my favorite part of running on the trails – getting up to the top of something or the end of something and the feeling of remoteness, even if you’re in a city park. I had this experience recently when I drove down to this place called Black Mountain south of Crossville, TN. I read about it in a Tennessee hiking guide but couldn’t find much information online. The trailhead was hard to find, and I was cursing my luck for driving 2.5 hours and now being faced with the prospect of heading back for Nashville with no run. I ended up finding the trail, which had no markings at its start. The trail was narrow, overgrown, and went up a solid incline that made keeping a run difficult. To make things even better it started raining, light at first then a downpour, and I could hear some claps of thunder that seemed closer every few minutes until they were directly overhead. But after about three miles of plodding upwards, things leveled out near the summit, and there was some interesting stuff up there, and I had the feeling that no one had been to this place in quite a while (I made a Strava segment of the climb to the top and plenty of people have been there…but it didn’t feel like it at the time). At the summit the storm chilled out for a few minutes and there were great views of the surrounding country side. The elevation is nothing crazy, but pretty good for middle Tennessee (about 2800 feet). In the end of I was thankful for the weather, because the low clouds made it feel like I was much higher up. This run in particular made me want to get out an explore some more trails in TN that are a little further away from Nashville, so the next week, on July 4th, I went out to Mousetail Landing State Park near Linden, TN and ran the Eagle Point Trail. AVOID THIS PARK AT ALL COSTS: I spent the next two hours eating cobwebs. The trail was runnable, had some good ups and downs, but I was stopping every five minutes to peel the webs and spiders off of me. You win some, you lose some. 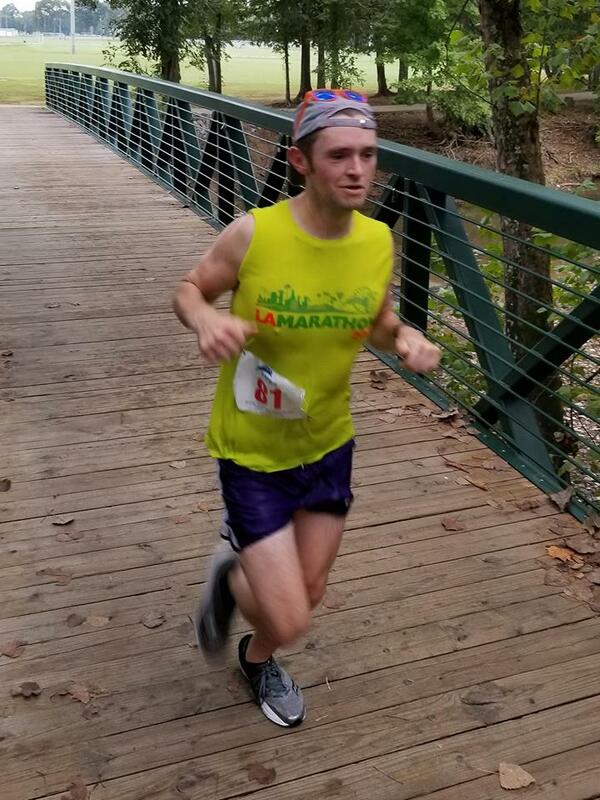 Ok, pardon the digression: post-Defeated Creek, I was pretty focused on Flying Monkey and then the Country Music Marathon in April 2018 (I signed up for it the day after the 2017 race in which I got roasted by the heat and, like many, had the most miserable running experience of my life). In the meantime, I ran the 2018 Dry Creek marathon and had a much better go of it than the previous year. It was the first time that I felt like I was actually pushing it and racing on a trail. Country Music went well (PR by about seven minutes). I signed up for StumpJump around this time and decided that I needed to do most of my running on trails. Being on summer break, it’s been pretty easy for me to carve out some time to get in two or three decently long runs during the week at Percy Warner. Looking ahead towards the next 2.5 months or so of training I’ll do more of the same – I work pretty close to the park, so I’ll head over in the afternoon/evening about twice a week and then get longer runs back-to-back runs in on the weekend. NRC: Huge thanks to Tom for sharing some awesome trails and runs with us! Stay tuned for his nutrition and gear go-tos, as well as any fun (or mishaps) he's had training so far! Even though back to school is just around the corner, summer is still in full force! Crew member Diane Zandstra offers up her favorite gear for running through the summer! I’ve run through this shoe but like it now for post-run and cross-training. 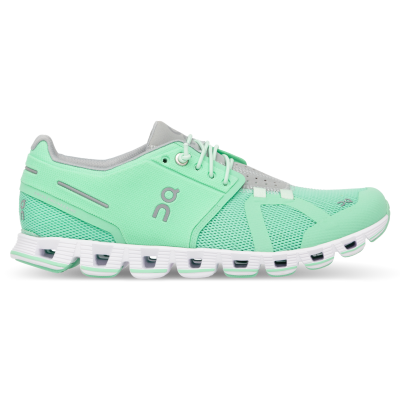 The elastic laces make it easy to slip on and off, and it’s the perfect lightweight, run around shoe for the summer. Plus, they are cool looking and the new colors are awesome! I love everything from Spring as it’s all natural and tasty. Always want to have these on hand for those long run days. What’s not to love about these sunglasses?!? Polarized, no slip, great colors (with funny names) and at $25, you can get several pairs. This brand is made for women and most items are number sized for a more precise fit. They use great fabrics and the waistband on this short is comfy with a drawstring and a zip pocket on the back. Thanks for sharing, Diane!! Stop by to try on or try out any of Diane's favorites!! Crew member Christa Poremba loves the summer and the heat! Part of that reason may be her summertime favorites from NRC -- she lays out what she uses to make the summer, not only bearable but fun! Brooks Levitate: I love these shoes because of how much responsiveness it gives. And I love the upper material as well. Flip belt: This belt is amazing to train with! Fits so many things in it! Balega socks: Ultra light is my favorite sock. Fits the foot like a glove. It has the perfect amount of cushion. I wear this sock all year round. From Christa: NRC is the best running store in town! With the most amazing crew :) We want everyone in Nashville to shop with us!